This is the 186th world-famous FOTM Caption Contest! 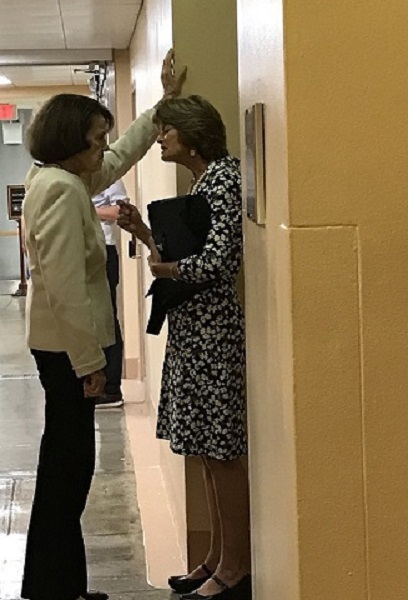 About the pic: The pic of Sen. Dianne Feinstein (D-CA), 85, apparently badgering Sen. Lisa Murkowski (R-AK), 61, was taken around the time of the Kavanaugh hearings. Murkowski was the only Republican senator who voted against Kavanaugh’s confirmation to the Supreme Court. This contest will be closed in a week, at the end of next Tuesday, October 30, 2018. This entry was posted in Liberals/Democrats/Left, RINO and tagged Dianne Feinstein, Lisa Murkowski. Bookmark the permalink. The Democrat National Committee will allow you Lisa, to pick up the money bags from our comrades in China, at the next money drop at the Buddhist Temple. Al Fraud Gore got a nice cut when we allowed him to do it………………..
I’ll run for president and you for vice president. Two democratic leftist lesbians can’t lose. I bought a new strap-on. Can I try it on you? Dianne; what would you charge to haunt a house?